Sailors clear debris from the apron near Hangar 6 on Ford Island. USS Shaw (DD-373) burns in the background. The pile of dirt in the center of the image may be the bomb hit from Lieutenant Commander Kakuichi Takahashi of IJN Shokaku, leading nine Aichi D3A Type 99 dive bombers armed with 250 kilogram (550 pound) bombs. 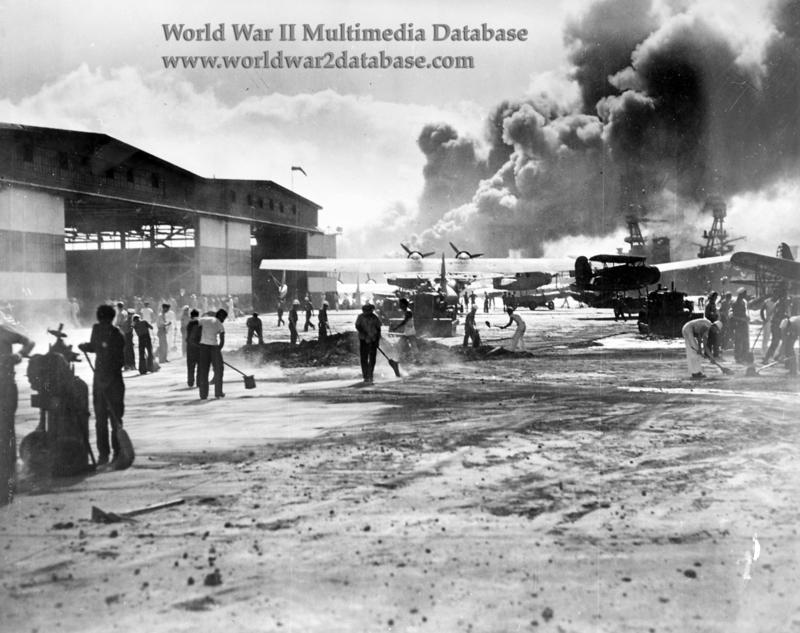 The others scored six hits, causing extensive fires and burning part of Hangar 6. Thirty-three of seventy aircraft were destroyed or heavily damaged. Patrol Wing Two repaired several aircraft for reconnaissance flights within hours of the attack.